Greatwall is honored to be part of BOI Fair 2011 to present our product under the concept "Going Green for the Future" and depicting three sustainable methods; 3Rs (Reduce, Reuse and Recycle); our insulated panel has been constructed 3 pavilions. It symbolizes the green sustainable living of mankind. Simple design yet outstanding. 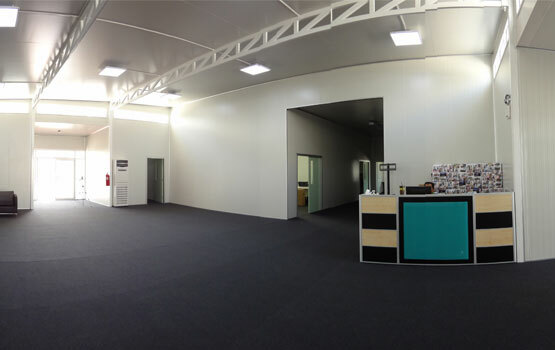 Press center pavilion is built from Cliploc and Solarslab panel to reduce energy consumption from air conditioning. Parabola structure above pavilion is equipped with solar cell to generate power for press center. Kemrex simulates the characteristic of Thai traditional house with high basement combined with modern construction design to build Kemrex Pavilion, demonstrating the strength of PRE FAB foundation. Visitors can learn the flexibility of the dome-like shelter constructed from Cliploc and Solarslab insulated panel which is designed for use as permanent or temporary shelter during natural disaster. PEA highlights the potential of power generation in Thailand through the use of the latest technology and alternative energy in 3 zones; PEA Smart Grid Zone; PEA Smart Home Zone; and Outdoor Exhibition Zone. Solar flower, wind turbine, and outdoor LED lights will also be exhibited to show the use of alternative energy for power saving.